In addition to fruit juice , a cup of tea brings the significant value of nutrition for our health. An iced cup of tea in the hot weather with somecookie is just wonderful. Instead of using a traditional tea pot, then adding ice to make your favorite drink, you have a quicker and better solution: an iced tea maker. But how to buy the best iced tea maker? Let’s go and find out the answer! How To Buy The Best Iced Tea Maker? TUO Cutlery ﻿﻿Vegetable ﻿Cleaver Knife 7"
An iced tea maker is an electric kitchen gadget that helps you make tea automatically, from brewing coffee powder to adding ice. There is a variety of tea makers on the market. Some models feature only a brewing unit as the main component, but many include a pitcher made of glass or plastic. Tea released from the brewing unit will be poured into this pitcher and ready to be served. For a thorough look at an iced tea maker, you can check this video. The volume of a standard pitcher is 3 quarts (or 96 ounces). But first, you should think of your demand. Who you’re purchasing the tea maker for? How many cups of tea do you want to drink each day? If the answer is about 2-4 cups of tea, then a 2-quart pitcher would be ideal. Two common materials for pitcher areglass and plastic . In case you’re finding some elegant luxury things for your kitchen, let choose a glass pitcher. For a plastic one, it’s better to beBPA-free, which will protect your health out of toxic chemicals. Stainless steel orplastic filters are fine. 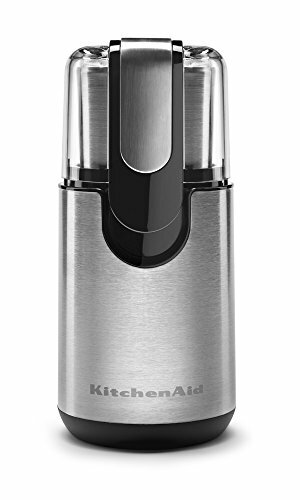 Personally, I recommend the stainless steel option because it’s durable, easy-to-clean, antibacterial and safe for our health. Compared to plastic, stainless steel is far better in all aspects. The best iced tea maker should have an airtight lid which helps to maintain the tea flavor and aroma longer as well as prevent the tea from hateful flies and other insects. Thanks to the lid, both of your tea and fridge will be well-preserved. Many iced tea makers come with a brew-strength bar which is responsible for adjusting the speed and strength of your machine. As a result, you can increase or decrease the brewing time to get full-taste cups of tea. A lot of models work either with bagged or loosed tea, while many others can solve two without any problem. You’d better choose them. Some high-grade models can even work well with coffee. If you buy them, you have two options in one single design – tea and coffee maker. Some devices aren’t simple enough to use. Having an easy-to-use model means that you will have less hassle to face. It saves time as well. Auto shut-off function and indicator lights are important features. They can be your lifesaver in many cases. Having a delicious cup of tea is the wonderful thing that I want to do every day. But cleaning isn’t! So, make sure that your future machine can be cleaned easily, either with a dishwasher or your hands! In general, tea makers are not expensive. Most of them cost you about $30, and rarely exceed $100. If your budget allows, it's better for you to get a high-quality model. This way, you have not only a more durable product but also plenty of advanced features as well as useful accessories included. Mr. Coffee is truly a well-known branch over the world. Their products are designed for coffee & tea makers, and the TM70 is not an exception. It’s user-friendly and full of innovations. The device canbrew up 3-quart (2.84 liters) of tea at a rapid speed. To blend a quart of tea and 2 quarts of water, it takes only 15 minutes or less. During this time, you don’t have to watch any hot juggle stream or sloshing water. Furthermore, it serves you delicious cups of tea with any flavor you want! The filter can solve both bagged tea and freshly ground. So, you won’t be limited to pure black tea. The BPA-free pitcher is not only safe for your health but also easy to clean. After finishing, just spraying it with bleach and water, washing with foamy water, rinse, and your pitcher will look like new! I love the smart design with automatic shut-off button. Thanks to it, you can walk away for hours and back when it’s done. Additionally, because the brew strength bar adjusts flexibly, it suits your tastes and saves your electronic bill effectively. It will be stronger when working with the hot water. If the pitcher and brewing unit are not aligned perfectly, the tea won’t go directly into the pitcher. It’s a bit noisy during operation. At first, I was impressed by its elegant appearance. The BPA-free pitcher is unbreakable and can stand the high temperature. So, you can put not only ice but also boiling water into it. Though its capacity is only 1qrt, it can make up to 4 servings. After adding the ice to the filter basket, I can shake the pitcher freely without any leaking. I like the filter, too. It’s so simple to clean! Those loose tea leaves will be put away effortlessly just by a few shakes. The size is great for me. It can hold a decent quantity of tea while fitting easily on every shelf in my fridge. The airtight lid keeps the tea fresh during storing time without any transfer of odors. This means my fridge doesn’t smell like tea, and my tea doesn’t taste like the fridge. What else? While using the Takeya, you don’t need to replace the top to pour; simply open the pour spout, then turn back to seal it tightly. The longer brew cup is ideal for tea that expanded greatly. Like Mr. Coffee, this one can solve both tea bags and loose leaf tea. It may too high to stand up in a fridge. At first, Ovalware RJ3 is aesthetically pleasing to look at. It looks simple but luxury. The extraborosilicate glass pitcher is definitely safe for your health. It’s durable and can stand the maximum temperature, too. There is a stainless steel filter inside. So, you never have to worry about the rust problem. I love the way the filter works. It goes nearly from the top to the bottom to prevent the tea ground escaping into the brew. Especially, it can be replaced by the rubber gasket. The BPA-free rubber seal can protect the brew from the bad odors in your fridge. The tea flavor will be kept in 14 days. Besides, the cold brewing feature offers you a smoother in taste, purer and healthier cup of tea. It can be used flexibly with hot or cold water. Aside from tea (both bagged tea and loose leave tea), the RJ3 works well with ground coffee, especially thecoarse coffee. It has a perfect height to store in a fridge (7/8’’ tall with lid). Additionally, the easy-access handle helps me have a smooth pouring. Stainless steel filter prevents rust problem. BPA-free seal maintains the tea odor. Borosilicate glass pitcher is extremely durable and heat-resistant. It isn’t good at filtering out the super tiny sediments. Here’s another choice that I was luckily experienced. It totally caught my eyes from the first sight! With the harmonious combination of green and white, it looks like an accessory in my kitchen. Besides, the 68305T should attend in your list because of many great features. The timer & steeping setting allows you to set the brewing time for the best specific preference. It also features an indicator light that stays on steadily till the process finishes without flashing; then the machine will shut off automatically. Instead of 3qrts as standard, the pitcher is 2.75qrts. Though it’s made of hard plastic, it looks more like the glass and even prettier. It alone is just 8’’ tall, while the complete one is 12’’ tall, so it takes up less shelf space in my fridge. The lid is really airtight and doesn’t seal at the top. Especially, this has several baskets: 1 for bagged tea, 1 for loose tea, 1 for sugar. So, I highly recommend this for the sweet lover. Just dump the sugar into the pitcher before you start. The 68305T can mix tea and sugar perfectly! Indicator light and auto-shut button make it easy to use. The filter is not replaceable. The lid sometimes doesn’t pour the tea out well. 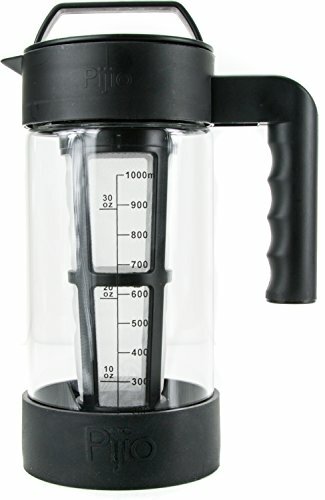 Now, I’ll turn to a product with unique design: Hamilton Beach Iced Tea M﻿aker 4091﻿1. I can’t deny that this is an excellent machine. Like the West Bend, this one has an indicator light and can shut off itself. So, all you need to do is turning on it, put tea, and it will do the rest task! Though its price would be a bit higher in comparison with those above products, the 40911 is incredibly endurable! After many used years, it still satisfies me! I think that you should give it a try. The 2qrts pitcher is suitable for small family. Because it’s slim and lightweight, you can hold and put it in your fridge easily. The machine is suitable for any kind of tea, whether loose tea or tea bags without the need for a paper filter. It also comes with a brew strength bar that can be adjusted up to your mind. The Hamilton Beach is a good server. It offers me a full container of tea just in 10 minutes. Besides, I love its customer service. They’re so careful and wholehearted. It goes with a thorough usage direction on the receptacle which is helpful for new users. Pitcher and brewing unit are connected for direct tea transport. It looks a bit bulky as assembled. 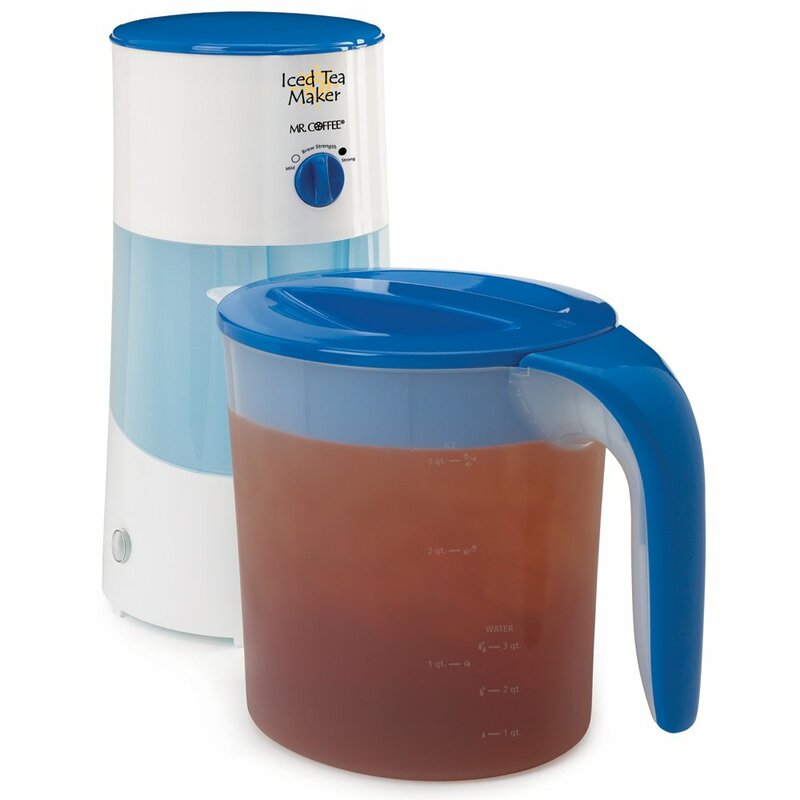 Overall, the iced tea makers have an affordable price. From 30$ to 100$, you can own the good one. However, with only about 20$-40$, a high-quality product will belong to you. In my opinion, I’m really keen on the Hamilton Beach Iced Tea Maker 40911. It totally meets my need! If you’re tired of normal tea pot, this one will be the best alternative. It’s simply powerful, versatile, convenient and safe to use. I hope that our honest reviews can help you find the best iced tea maker. And you? Have you decided yet? Please share with us your thought by leaving a comment below.